114 international comic artists illustrating positive political actions anyone can take to make the world a better place. DTL started as a free-to-view website (still online at https://drawthelinecomics.com) and now it’s entering its next exciting phase as a 144-page hardback. All profits go to the charity Help Refugees (https://helprefugees.org) – a pioneering charity leading a new movement in humanitarian aid, with more than 80 projects across Europe and the Middle East. So when you pledge for the book, you will already be taking a positive political action to help people who need it most. When you pledge you also get the option of exclusive rewards that include bookplates, original artwork and prints of the Draw The Line images, plus the opportunity to have one of the artists come and run a workshop or give a talk for you and your friends! 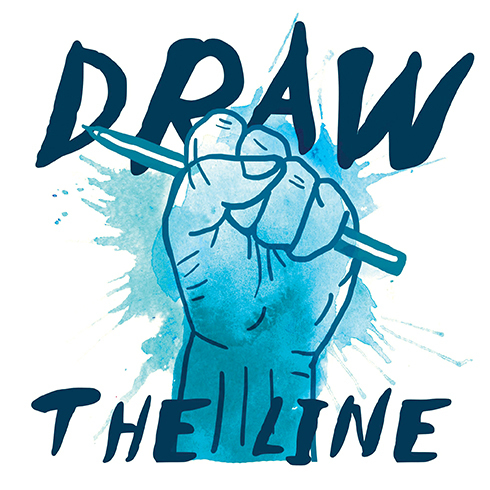 Draw The Line is the essential toolkit for anyone feeling powerless in the current political environment... and it’s a fun read, too!